Sunday January 31, 2010, the Toronto Maple Leafs made two huge roster changes by adding defenseman Dion Phaneuf and goaltender Jean-Sebastien Giguere. The Leafs sent Jason Blake and Vesa Toskala to the Anaheim Ducks in exchange for Giguere. In the Phaneuf trade the Leafs also acquired Fredrik Sjostrom and Keith Aulie. 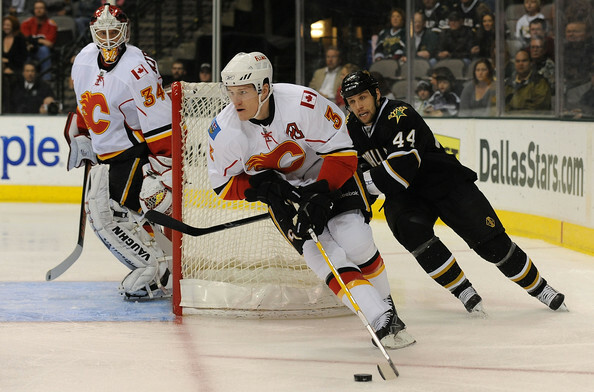 They gave up Ian White, Matt Stajan, Niklas Hagman, and Jamal Mayers to the Calgary Flames. Toronto who has a disappointing 17-28-11 record and 45 points, and they are tied with the Carolina Hurricanes for last in the Eastern Conference. As of Sunday Phaneuf had 10 goals, 12 assists and 49 penalty minutes. Not exactly the numbers he has put up the last four seasons, but he is still playing solid D. Phaneuf is probably one of the best hitters in the game and has been compared to Hall of Famer Scott Stevens. Leaf’s General Manager Brian Burke says he is the “elite player” and made attempts to get him earlier in the season. “This guy’s a warrior He’s got a cannon for a shot. He plays the game hard…I want players who play the game hard because they’re hard to play against,” says Burke. Phaneuf says that he was surprised by the trade but has no hard feelings because “it’s part of the business.” On the other hand he says that he is very excited to be playing in Toronto because it is the biggest hockey market in the world. Hopefully he will be able to handle the media and fans, who tend to be pretty tough on the players, because he did not take it too well when his own coaching staff told him he needs to improve in certain areas. Giguere was on his way out of Anaheim sooner or later because Jonas Hiller took the starting job from him and who also signed a 4 year extension on his contract. 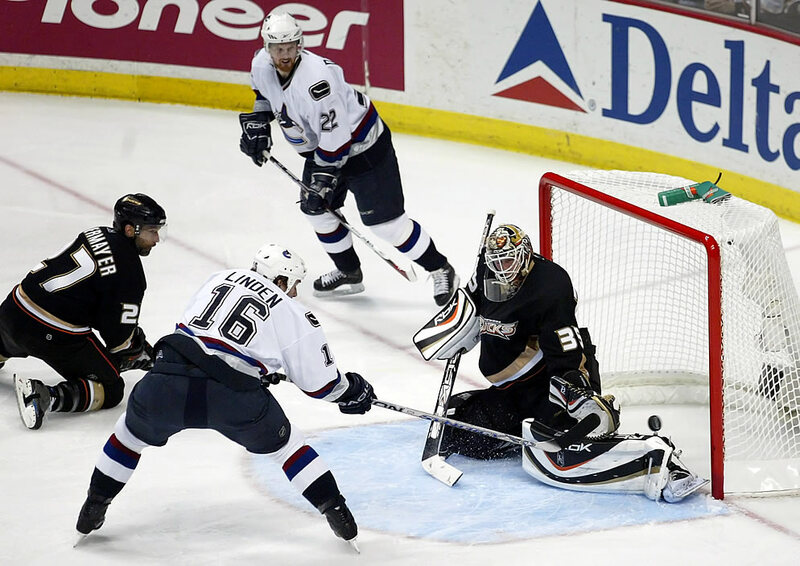 Giguere has won the Stanley Cup in 2006-07 when Burke was the general manager for the Ducks and was awarded the Conn Smythe Trophy in the 2002-03 finals even though his team did not win. He also has a history with Toronto’s current goalie coach. especially Nazim Kadri and Kyle Palmieri. Their defense is in good shape with the addition of Phaneuf. They still have Luke Schenn, Tomas Kaberle, and Mike Komisarek. Giguere gives the team a solid starting goaltender, even though his numbers are not as good as they use to be, he is still capable of being a reliable starting goaltender, something that Toronto really needs. The Ducks got a pretty good deal by scoring Jason Blake who will most likely put up better stats playing along side more star quality players that are in Anaheim. Calgary however, probably could have got more for Phaneuf from another team. I think that they panicked and went for the deal. Only time will tell. I am interested on other people’s thoughts are on the trades and who came out winners in the deal. Phaneuf and Giguere made their debut’s with the Leafs Tuesday Feb. 2, 2010, beating the New Jersey Devils 3-0. Giguere recorded the shutout and was named first star by making 30 saves. Phaneuf was names second star and recorded no points but had 6 hits and got into a scrap. So far it seems like things are looking good, but it is only their first game with the club. This entry was posted in Hockey and tagged anaheim ducks, dion phaneuf, giguere, Hockey, jean-sebastian giguere, maple leafs, NHL, phaneuf, roster, rumors, toronto maple leafs, trade. Bookmark the permalink.